"In the soft, warm bosom of a decaying compost heap..."
I almost didn't see the box tucked behind the flower pot by the front door. Who knows, it may have been there for a couple of days. But I did finally see it. Inside was my new-to-me copy of The Complete Book of Composting by J. I. Rodale and staff (Fourth Printing, 1967). Coming in at 1,000 pages plus (if you count the index), it's a hefty tome. I look forward to the secrets of composting which will surely be revealed to me as I ponder the wonders within this book. The first few sentences of chapter 1, The History of Compost, draw you right in, don't they? "In the soft, warm bosom of a decaying compost heap, a transformation from life to death and back again is taking place. Life is leaving the living plants of yesterday, but in their death these leaves and stalks pass on their vitality to the coming generations of future seasons. Here in a dank and mouldy pile the wheel of life is turning." And if that isn't enough to make a gardener want to go out and at least give a friendly pat of thanks to her compost pile, if not a hug of gratitude, they've included a poem by Walt Whitman. Behold this compost! behold it well!! visage out of its graves. such leavings from them at last. 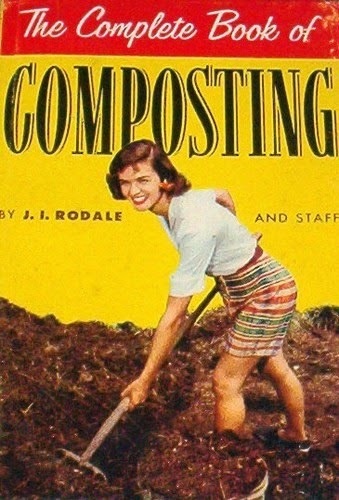 Yes, we can poke a little fun at the idea of 1,000 pages written on the subject of composting, especially now when people seem barely able to stay focused through a few paragraphs of information glowing at them from their computer screen. But composting really is an important topic not only for the home gardener, but for everyone involved in tending the earth and growing crops, whether on thousands of acres or on a tiny urban plot. For everyone who gardens soon learns that the soil must be replenished. And adding compost, adding organic matter, is how soil is replenished. That's how it was eons ago. That's how it was 55 years ago when this book was first published in 1960, and that's how it is today. There is no substitute for adding back organic matter to your soil to replenish it. If you are gardening and you aren't composting, make it a resolution to start a compost pile, or two or three, somewhere in your garden this spring. You'll be a better gardener for doing so. And you'll have better soil, too. Best post title I've ever seen : ) Made me laugh. Can't imagine 1000 pages about compost. It is a necessary and advantageous component of the garden. That Walt had something to say about everything and he did so eloquently. He had me at "What chemistry!" haha. And that book cover is perfect. When I first saw the image I thought: Wow, they have really captured the look -- thinking it was meant to be ironic. Joking aside you are so right. Soil needs to be fed. I am endlessly fascinated by the mysteries of compost. Looking forward to hearing more. It's the promise of things to come out of something that cost little or nothing that makes compost heaps so enticing. Yesterday we went to the annual Snowdrop Day & Sale at Myddleton House. Just down the road from us, but people came from far and wide for the sale, buying and selling the rare and the beautiful in little over an hour. I saw more £50 pound notes in that hour than I will for the rest of this year. After the sale, most of the visitors headed into the garden proper, to visit the now restored bulb meadow and rock garden, to examine and photograph countless different snowdrop cultivars, plus a few of the earliest open ground narcissi. We did to, but we also wandered round the near dormant kitchen. Sometimes seeing the bare bones of a garden is as instructional os seeing it in full growth - pruned and trained fruit trees, especially. Aside of admiring the size and number of varieties in the rhubarb bed, we admired, studied and photograph a true behemoth of a composting set-up - 4 bay (3 in use and one for wheelbarrow parking) steel rsj's for uprights and untreated railway sleepers for horizontals. Mighty and robust. Something to aspire to that only gardeners would understand. Thanks so much for including this poem by Walt Whitman, Carol--somehow this poem was overlooked in all the Lit classes I took! I also love the first lines of the book--beautiful imagery. I think I'll pass on reading the book, though I'm curious how the writer could find enough on composting to fill 1000 pages! But I do appreciate the message; in fact, you've reminded me that the two coffee cans under my sink filled with coffee grounds and vegetable peelings really need to be dumped on the compost pile today.